This CD is a recording of a big band with an amazing collaboration of soloists that are playing a wide variety of compositions by Mica Bethea spanning multiple styles that tells the story of his life. Click image to sample and purchase! This 2 disk set of music features the beauty of recording a big band in the studio (disk 1) and live in concert (disk 2) with many amazing arrangements by Mica Bethea and incredible solos from the top musicians in the North Florida region. This 2 disk, live CD/DVD recording is of a big band with an amazing collaboration of soloists that are playing a wide variety of arrangements by Mica Bethea spanning multiple styles. "What can you say about a cat that’s so brimming with ideas and vigor that he doesn’t let a little quadriplegia slow him down? An ambitious double discer that finds him dishing up the same tunes live and in the studio with a crew that plays like you’ll be knowing all their names in short order, this bunch doesn’t serve it up like your father’s big band. With smoking charts and tunes at hand, this cat isn’t telling you his back story for any ‘poor me’ askance as the music that speaks for him stands straight and tall. Energetically eclectic, this set is a total cooker that’ll open your ears in fine style. Well done." "Mica Bethea has a way of combining big band sections and voices while underpinning his writing with driving funk that gives his work an urgent originality. He doesn't quite sound like anybody else out there and it will be interesting to see where his career goes from here. For now he's made a very impressive first step." 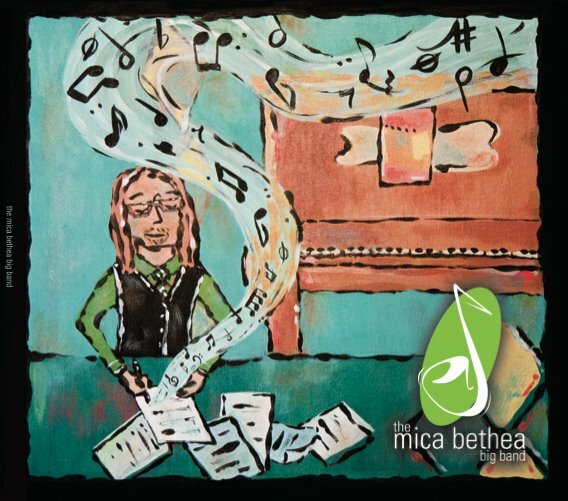 "Mica Bethea is a talented musician who has a distinctive flair for composition and arranging. His compositions tell an interesting tale with complexity, intrigue, and unexpected twists and turns. His arrangements are swinging and uplifting. This young man has a real solid voice with his writing that reflects a keen sense of dedication and focus. Keep an eye and ear on Mica. He is poised to go on to do great things"
"There's a great balance between improvisation and composition. This balance is hard to strike and can be easily over looked. It about the whole, not simply it's parts. In short, Mica provides the right measure of space for his great soloist to become an integral part of the composition. …he and his wonderful band members have created a work of art." "That's as good as it gets and stands up against anything in the country - and the world for that matter."